Join the Visbal Sculpture email list and enjoy V.I.P. 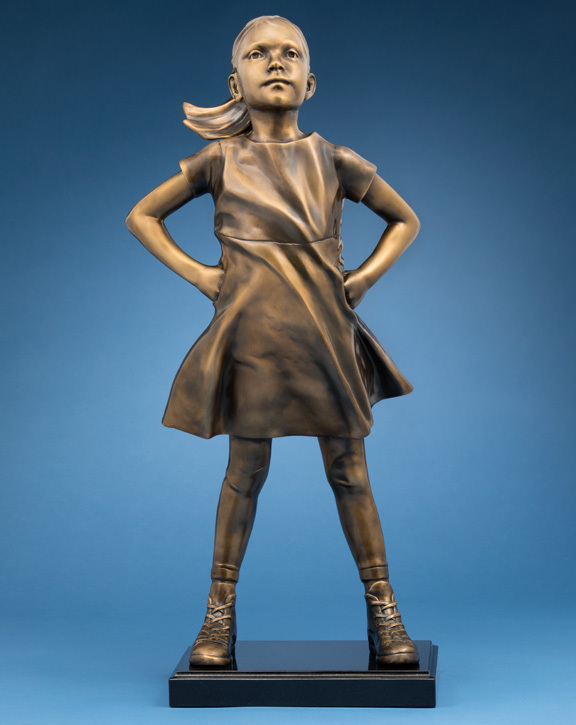 pre-purchase privileges with advance notification of Fearless Girl reproductions. Next release: Illustrated Children’s Book! Non-Profit Donation: 20% of Net Proceeds! 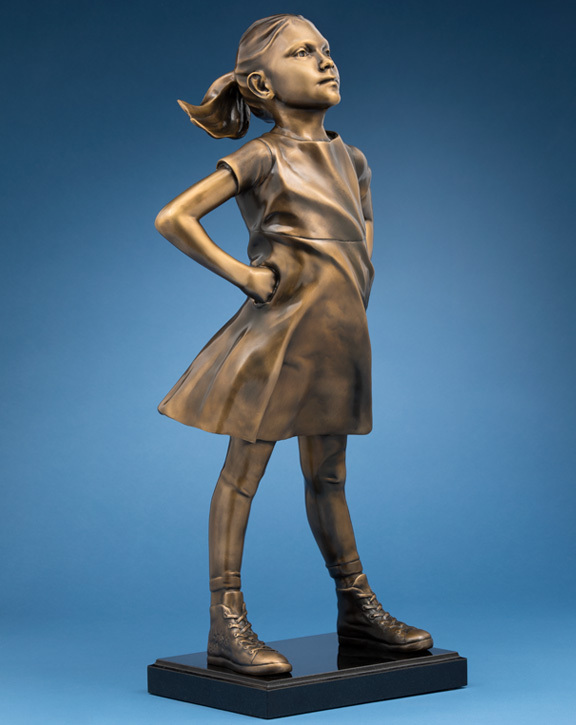 I’ve heard your requests for reproductions and am thrilled to bring you this miniature bronze Fearless Girl at 22+” (2/3 a meter) high. 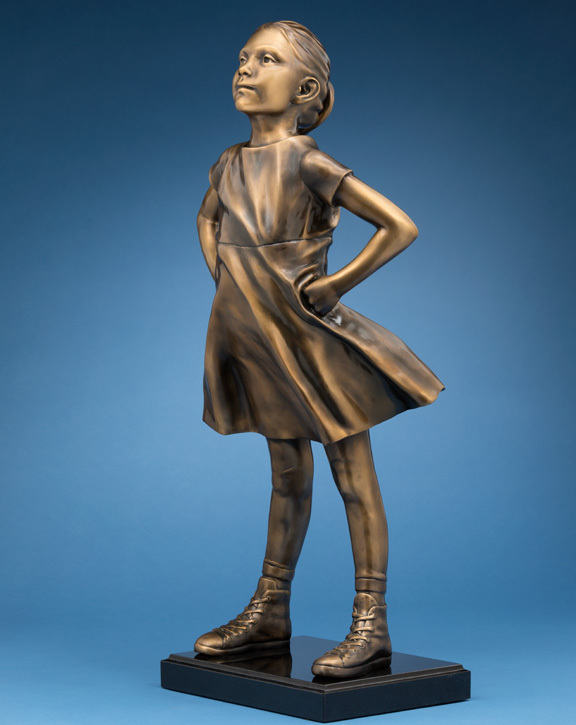 My hope is that your limited edition bronze will serve as a symbol of empowerment and encouragement and as a reminder that collaboration between genders and culture is the enlightened path forward for smarter, stronger decisions. To support women in leadership positions, the empowerment of young women, women’s education, gender equality, the reduction of prejudice in the work place through education, equal pay and the general well-being of women. 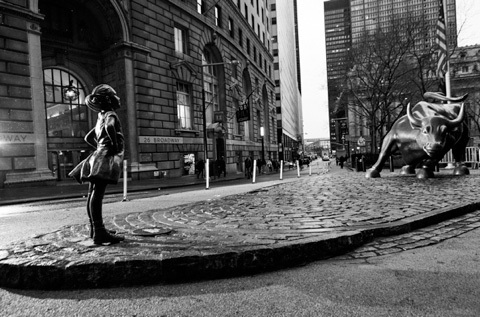 To preserve the integrity of the Fearless Girl design, a 3d scan was performed on the 50½” Wall Street figure in June 2017. 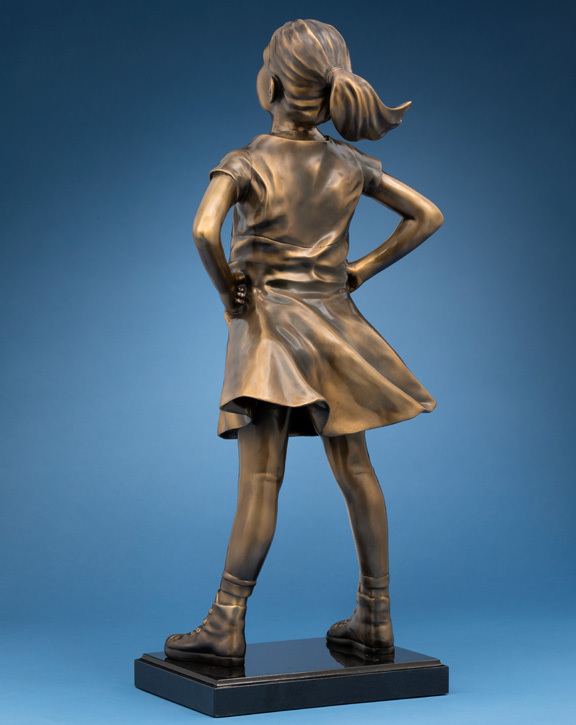 A miniature 3D print was created in vero photopolymer and perfected for casting in bronze. Each miniature is cast on order using the lost wax casting method and comes mounted on a 4cm high base of absolute black granite. Your casting will be signed, numbered and packaged in a velvet lined black presentation box including a signed Certificate Of Authenticity. 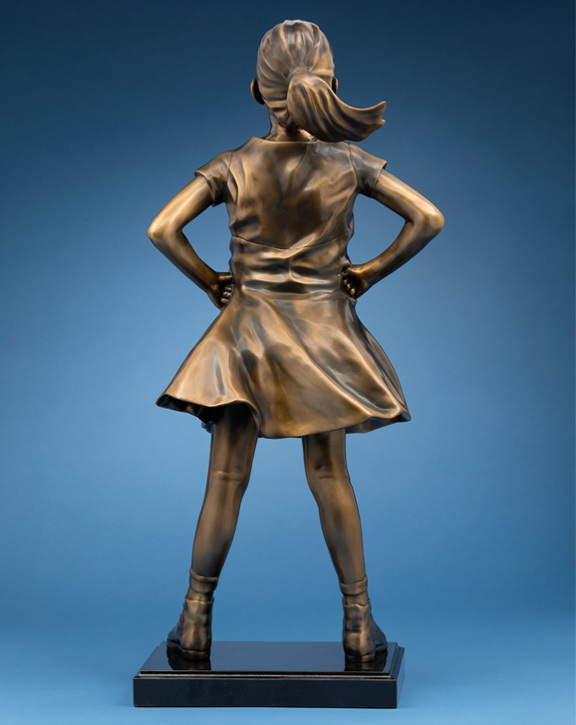 An elegant gift for the fearless girl in your life! Patina: Butterscotch Brown — no substitutions please. Base: Absolute Black Granite 23cms W x 17cms D x 3cms H — no substitutions please. Terms: A 60% deposit or $3,990 reserves your casting. 40% or $2,660 of your purchase is due when your casting is ready to ship and includes shipping to the continental U.S. International shipping will incur an additional fee to be calculated at the time of shipment. An $95 allowance towards shipping to Hawaii, Alaska or abroad will be applied. Production Time: Production is completed on a first come, first serve basis. Your deposit reserves the lowest available casting number. Every effort will be made to produce your casting as quickly as possible. Be advised that production has averaged 6 to 7 months. Two additional foundries will commence production in order to reduce production time. Please be patient. Cancellation is not permitted beyond 14 days from the purchase date. Please check back for photos of the Certificate of Authenticity and presentation box. Warranty: Your work is guaranteed for workmanship up to one year after delivery.